I wake up early, fiveish. It's still dark outside. I get up and take a hot shower. Oh the luxury of living a civilized life. I get dressed and finish packing. It's time to leave this comfortable room. I checkout and walk down to the coffee kiosk. It opens at five thirty. There is no line and I get a twenty four ounce hot mocha. I walk up to the Bridgeside Cafe and sit on the bench in front. They're not open yet. I sit and wait enjoying my mocha. When they open I go in and get my breakfast that comes with my room. I climb the hill to the toll booth of the bridge. They wave me through and I'm Walking across the ‘Bridge of the gods’ into Washington. I don't know why but a wave of emotion hits me and makes me teary eyed. Maybe it that I only have one more state until I'm done. 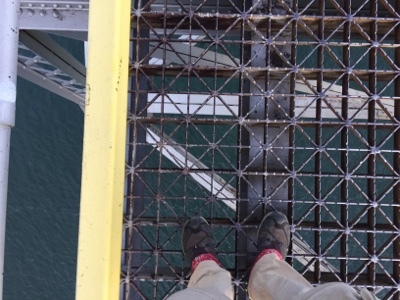 The bridge has a metal grating for decking. I can look straight down to the river flowing beneath my feet. It's a little unnerving, especially when an eighteen wheeler rolls by shaking the entire bridge with its passing. I follow the signs into the trees of Washington. The bridge’s elevation is about one hundred twenty feet above sea level. I climb up through the trees. Up and up and up, for hours and hours. I reach the ridge top sometime around lunch. I stop and eat a peanut butter tortilla and one of my peaches. Two more to go. My pack feels so heavy. Resupply with extra tortillas, peaches, and my pound of peanut butter causes it to feel heavier than I have felt in a long time. By mid afternoon I am exhausted and all I want to do is camp. Set up my tent and sleep. No luck. I have to put in enough miles to set me up for tomorrow. If I don't, I'll fall behind. I force myself to keep moving. This isn't forest, this is woodlands. The elevation is too low. Sure it's green, yes there are trees, but it's not the same. Greens and browns, I'm surrounded by them. The trees are so thick I can barely see the sky. The trail goes on and on. It feels like forever. I feel hemmed in, trapped, stuck in a never ending green tunnel. Like I'm in a green tinted hamster ball. Which ever direction I go I seem to see the same thing, the same trees. I climb up to the top of a ridge. Blue sky! On one side are large trees, on the other, the sunny side, a dense forest of Christmas trees. Everyone about seven feet tall, too tall to see anything that way, the other side a dense wall of tall trees. The sun blazes down, baking me like a foil-wrapped potato, except instead of foil it's dirty smelly hiking clothes. A little bit further and I'm back in the green hamster ball. Down switchbacks. I hear a Walmart air horn blowing signals. Like I heard coming into Castella. Signals of some kind meaning something to someone. Meaning nothing to me. Down the hill I pop out of the trees into a clear cut. Everything has been cut down. The branches and debris makes it impossible to walk anywhere except on the trail. The trail walks me right through the middle of the devastation. It's hot, no shade. There's a big green machine stacking logs. Or moving them, or something. I keep moving, back into the woods. I stop at a creek and get enough water to camp. I am now set as soon as I can find a suitable place to camp close to my goal. The maps shows an abandoned road at the top of the next ridge. I climb with the thought of camping there when I reach it. I'm so tired that my legs feel heavy. Each step is difficult and I want so badly to stop. Up and up, switchbacks lead me one way and then the other. There isn't any decent place to pitch a tent. So I climb. Higher and higher. Hours pass and it's getting late. About three quarters of a mile to go to reach the abandoned road. I see a trail heading off and up towards the ridge top above. Do I take this? Perhaps there's a campsite up there. There's been nothing along the trail. I decide to climb up and check. After a short hike I reach the abandoned road at a different place than where it meets the trail. There is a nice flat spot about fifty feet up the road. I decide to camp here. It's quiet, no one else takes the side trail. I'm on the top of the ridge. I really can't see very much because of all the trees. It's cooler, a breezes wafts over the ridge. I sit in my tent and make dinner. A bee buzzes by. Not once, over and over again. It flies into my tent flies back out, buzzes around my legs, back in, then out. It's annoying and driving me batty. Every time it flies in I try swatting it. It laughs and does another lap. I try to ignore it. Finally it lands on my tent right above my head. I can see it sitting there on the other side of the translucent fabric of my tent. I flick my finger as hard as I can at its shadow. “Surprise surprise Mr. Bee, enjoy your E ticket ride,” I'm not sure where it went, but it sailed away from my tent, and it wasn't buzzing either. I wasn't bothered again. That certainly was satisfying, meting out just desserts to the offending bug, weird justice. I enjoy my Backpacker's Bistro Meat Lover’s Beans. It’s like the beans someone brings to a backyard burger party. With real bacon! Fabulous dinner after hiking all day. I actually feel full after dinner. I complete my chores and am laying down in my tent as the sun slowly sets. I don't see it, I fall asleep within minutes of laying down.